Definition: The Marketing Research is the systematic collection, analysis, and interpretation of data pertaining to the marketing conditions. The basic reason for carrying out the marketing research is to find out the change in the consumer behavior due to the change in the elements of the marketing mix (product, price, place, promotion). The marketers need to know about the changing trends in the market viz. Changes in the customer’s tastes and preferences, the new products launched in the market, prices of the competitor’s product, the close substitutes of the product, etc. Define the Problem-The foremost decision that every firm has to undertake is to find out the problem for which the research is to be conducted.The problem must be defined adequately because if it is too vague, then it may result in the wastage of scarce resources and if it is too narrow, then the exact conclusion cannot be drawn.In order to define the problem appropriately, each firm must have a clear answer to the questions viz. What is to be researched (content and the scope)? And Why the research is to be done (decisions that are to be made)? Data Sources: The researcher can collect the data pertaining to the research problem from either the primary source or the secondary source or both the sources of information.The primary source is the first-hand data that does not exist in any books or research reports whereas the secondary data is the second-hand data which is available in the books, journals, reports, etc. Observational Research: The researcher can collect the information by just observing the happenings in the market and sometimes having a friendly conversation with the customers to know about their purchase experiences. Ethnographic Research: It is one of the forms of an observation research where the researcher studies an individual in the real life situation and not under any market setup or a lab.The purpose of this research is to know the way people live (their lifestyles), What they do to earn their livelihood, how they consume goods and services, what they need in their personal and professional lives etc. Focus Group Research: It is a form of group discussion wherein six to ten people gather and discuss the common topic given by the moderator.A moderator is a person who conducts the group discussion and is skilled in group dynamics. He also keeps the discussion focused on the topic so that relevant information can be obtained from the group members. Survey Research: These are the descriptive research generally conducted to know the about the customer’s knowledge about the product, their preferences, and satisfaction level. The best way to conduct surveys is through the Questionnaires. Behavioral Data: The customer’s actual purchases at the store reflects its behavior and the choice of products. Thus observing what customers are buying gives more accurate information about the customer rather than the planned answers given by them in the surveys. Experimental research: This is done to find out the cause and effect relationships. This research is undertaken to study the effects of change in the customer’s behavior due to the change in the product’s attributes. The sampling Unit i.e. whom, shall we survey? The sample size, i.e., How many units in the population shall be surveyed? The sampling procedure, i.e. How the respondents shall be chosen? Contact Methods: The researcher has to choose the medium through which the respondents can be contacted. The respondents can be reached via emails, telephone, in person or online. Collect the Information: This is one of the most expensive methods of marketing research. At this stage, the researcher has to adopt the methods to collect the information, he may find it difficult to gather the correct information because of the respondent’s biasedness, unwillingness to give answers or not at home. Analyze the Information: Once the information is collected the next step is to organize it in such a way that some analysis can be obtained. The researchers apply several statistical techniques to perform the analysis, such as they compute averages and measures of dispersion. Also, some advanced decision models are used to analyze the data. Present the Findings: Finally, all the findings and the research are shown to the top management level viz. Managing director, CEO, or board of directors to make the marketing decisions in line with the research. 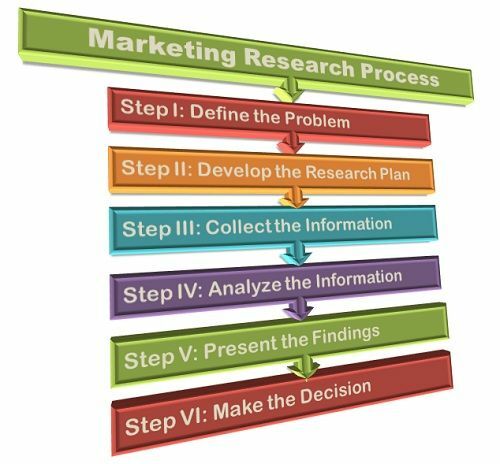 Make the Decision: This is the last step of the marketing research, once the findings are presented to the top level management it is up to them either to rely on the findings and take decisions or discard the findings as unsuitable. Thus, marketing research is done to gather all the relevant information about the market and design the marketing strategies accordingly.